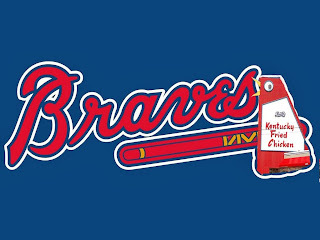 Ok so the Barves moved again. Or, will move in three years but who's counting. This ain't no big deal, They've moved three times already. Boston to Milwaukee to Atlanta to an Atlanta address but not in the same county as Atlanta so not quite Atlanta and there's a whole bunch of Georgia/Atlanta politics bubbling under the surface that you really really don't wanna know about but still pretty much Atlanta when you get down to it. That's gonna be difficult to fit on an away jersey. It'll probably all end up being a ruse by Liberty Media to burn their bridges with the city, then bungle the deal with Cobb County thus allowing them an excuse to move the team to Salt Lake City or San Antonio. Maybe even Miami, they could use a team. Well, we got three more seasons at the Ted anyway, and I'll probably drop dead of a stroke from watching too much Cable TV News by the time the team actually moves somewhere. To celebrate our nomadic tribe of warriors, here's a card from the first city they popped up in. Old Bowman! Not 1948 Bowman, those are black and white. 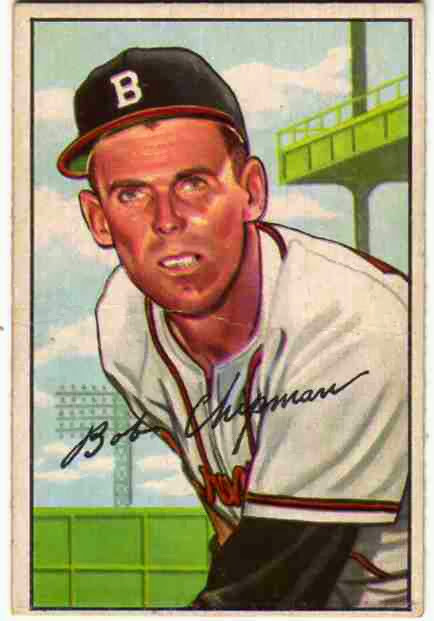 Not 1949 Bowman, those have a black and white picture with a solid color background. Not 1950 Bowman, those are small and square. Not 1951 Bowman, Those have a solid block with the name on the front. This is 1952 Bowman also known as 1951 Bowman with a fake signature. Also the back only has black ink instead of red and black ink. This is the set Bowman kinda screwed the pooch on, as they basically rehashed the previous year's set while their competitor came up with a product that was vastly superior. AKA Topps' business plan for the past few years. Oh wait! Silly me, Topps doesn't have competitors anymore. So here's the back. Snooze city. No color, no stats, bottom third is basically an ad. And who the heck are Haelan Laboratories? Was Bowman gum created by Mad Scientists? Was Sy Berger actually a superhero who saved America from being poisoned by radioactive space gum sold by a front confectioner run by Cold War spies? Where can I get a baseball cap for 50 cents and five Bowman wrappers? Would it actually be cheaper to just buy the cap outright instead of buying five packs of 2013 Bowman? If I sent in the wrappers to Topps would the case breakers just get all the caps because they sent their wrappers in first? Why am I asking so many questions? Why am I being so evasive? What do I have to hide? I don't know a dang thing about Bob Chipman other than he's a high number card and Bowman high numbers are as annoying as Topps high numbers but not quite as annoying as Heritage High Numbers. 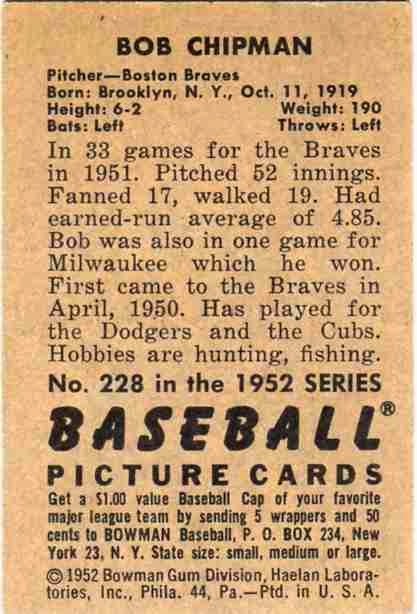 Actually I do know something about Bob, he pitched and won a game for Milwaukee in 1951. CAN YOU SAY FORESHADOWING. That would be like Topps putting "Freddie likes to eat wings at the Big Chicken" on the back of Freddie Freeman's card. Maybe Topps will do that next year. At least they've stayed put in Duryea, PA. I can't handle any more unexpected moves. none of this 'rebranding' crap.